Add the chopped potato, aubergine, ground coriander, cumin and turmeric. Stir to coat vegetables evenly and then cook over a high heat for 3 minutes stirring occasionally. Remove from pan and set aside. To make the sauce: Heat the oil in the pan. Add the onion, crushed garlic, grated ginger, cassia bark and whole cloves and cook for 1 minute. Add chopped plum tomotoes, turmeric, coriander, cumin, garam masala, salt, sugar and chilli to taste. Cook on a high heat for two minutes, then lower to a medium heat and cook for a further 3 minutes stirring occasionally. 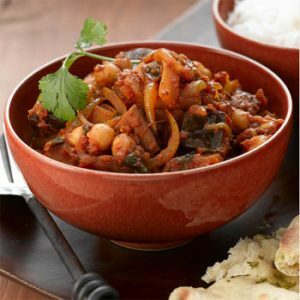 Remove the cassia bark and blend the sauce roughly with a hand blender, then add the vegetables and chick peas to the sauce with 3 tablespoons of chopped coriander, the water and the garam masala. Cook over a low heat for 20 minutes, stirring occasionally. Garnish with remaining chopped coriander and serve with Basmati rice and/or naan bread. The Vegetarian Society Approved trademark is the original and only one to trust. The only legally licensed vegetarian trademark, you can ensure that where you see its logo, all products have passed through its strict criteria and can be guaranteed 100% vegetarian. Copyright © The Vegetarian Society 2006.